Parkrun. It’s running…in a park. If I’ve made that sound a little simplistic, that’s because it is, and that’s why I love it. For anyone unaware of Parkrun, the format is possibly the most basic running event you will ever enter. Every Saturday morning at 9am 150+ runners of wildly varying ability set off for three laps of Pittville Park. The course is measured, marked and marshalled by volunteers and when you cross the finish line 5km later you will receive an official run time. All this is completely free of charge, there are no bells and whistles, no finishers medals or winner’s prizes, and all you have to do to take part is register once and turn up whenever you want to run, remembering to bring your personal barcode. So what makes Parkrun so popular? There’s no doubting that popularity. In the UK there are now 178 Parkruns taking place each weekend, averaging 134 runners at each, that’s nearly 24,000 participants every Saturday morning! In Cheltenham alone numbers over the last 7 weeks have averaged 170 and there are consistently high numbers of new runners trying their first Parkrun so the future looks bright. However when I caught up with Event Director Malc Smith and asked about the aims of Parkrun Cheltenham he was clear that numbers aren’t an important part of the Parkrun model. “We have no target for making Parkrun as big as possible or anything like that, obviously being free there are no financial targets so every week we have at least one runner is a success! The ethos of Parkrun is simply to provide an organised, inclusive event for runners at all levels”. In fact, beyond the usual Facebook and Twitter (@cheltnamparkrun) presence there is no marketing for Parkrun, success is due to word of mouth and news is spreading fast. 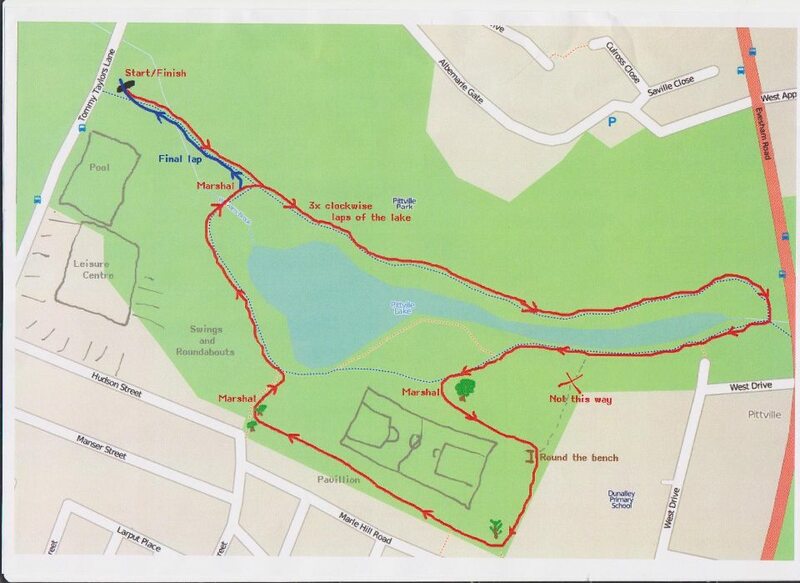 The Parkrun Cheltenham course. 3 laps of the lake. Malc was instrumental in bringing Parkrun to Cheltenham after experiencing events around the country. In a town with such a strong running community it was obvious there was an opportunity here, and in September 2012 Parkrun confirmed no one was yet looking to organise anything local. The first step was to get the right people involved, and with support from running enthusiasts contact was made with the council’s Healthy Living team and University of Gloucester. Soon start-up funding was secured (to cover the costs of flags/signage/marshall bibs etc), the venue agreed and Parkrun Cheltenham was becoming a reality. 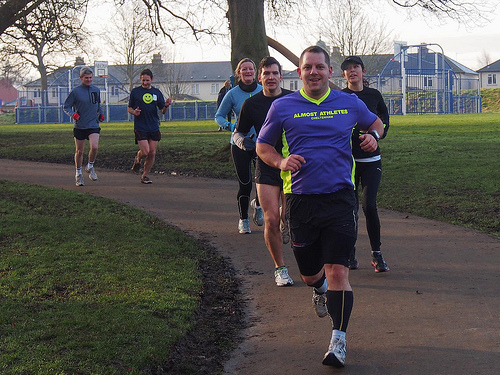 After a low key trial event Parkrun Cheltenham officially launched on 16th February with 234 runners in week one! 7 weeks later we’ve had visits from running royalty (David Moorcroft, former World record holder), wedding parties, course record hunters and more. 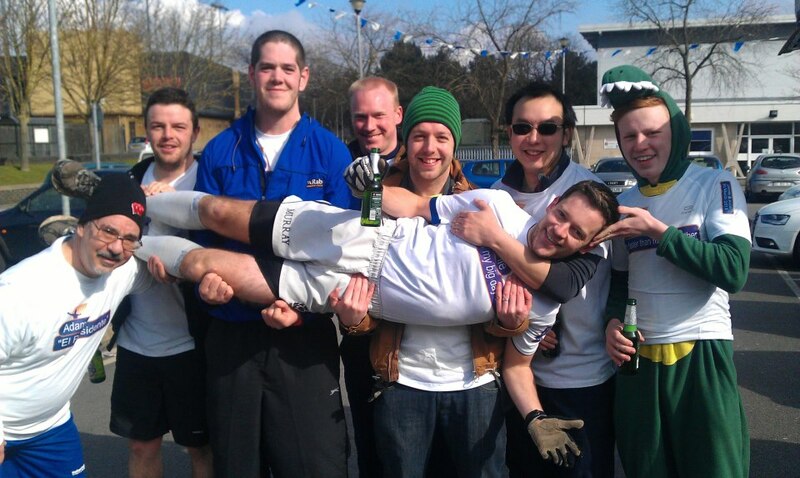 Jamie the groom and his friends enjoyed Parkrun on the morning of his wedding to Alice. Congratulations! 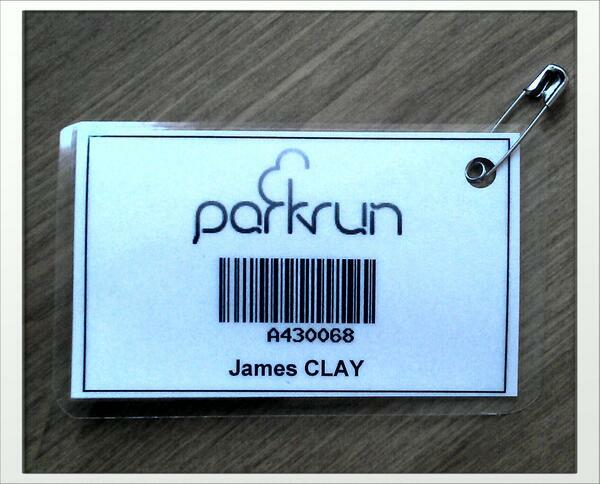 So what does it feel like to be a Parkrunner? Well I’ve done 4 now, and also volunteered to marshal one Saturday morning, and each time it has been a great experience. Runners gather by the University gazebo where Malc will normally say a quick hello and explain how Parkrun works. Hellos are shouted to any new or travelling Parkrunners (Parkrun tourism is growing in popularity) and then the Run Director is introduced. Malc was at pains to point out it is a Run Director NOT a Race Director. Although the event is timed there are no prizes so the only competition is between yourself and the clock. With any last minute course updates and advice given to the crowd, at 9am precisely runners stream over the start line for 3 laps of the park. The route is mostly on the tarmaced paths around the lake and the start line congestion soon spreads out as people find their natural pace. There is a section of a few hundred metres across the playing field which can vary depending on the weather, but the going is normally pretty firm and it’s nice even ground so road shoes are the usual choice for most runners. Marshals occupy the course and give welcome encouragement as well as direction and after 3 laps it’s a short sprint up the hill to the finish line. Timing is recorded using barcodes and you will receive a text/email with your results later in the day as well as an email with all the stats for the day and weekly Parkrun news from around the country. What a good looking chap enjoying Parkrun Cheltenham! The leaders today will have finished in around 18 minutes, with the course average being 27 minutes and the last finishers crossing the line after 50 minutes it really does encompass all levels of runner. Thanks to the timing and results service you can track your progress so whether you are an athlete looking for a fast time or new to running and just want the experience of running in a crowd Parkrun has something to offer. I urge anyone with a pair of trainers to register today for their nearest Parkrun and go along next weekend. If that’s Cheltenham let me know, would be great to run with some of you! So there, it really is that simple, and I’m sure Malc has nothing to worry about because there will always be at least that one runner on the start line to make the event a success…me! Running – Go to the Parkrun registration website and follow the very simple instructions. Print your barcode and bring it with you to your nearest event. There is no need to register at each event, just be there ready to run at 9am. When you cross the finish line you will be given a token for your finishing position and once you’ve got your breath back you have the token and your personal barcode scanned. There’s nothing more to it than that! Volunteering – Parkrun relies on volunteers to keep going. Roles include marshalling, timing, back-marking…there will always be something you can do to help! Find your local Parkrun event here and get in touch with them. It’s a great way to experience Parkrun before you come along to run, or to stay involved through injury or on rest days. This is my barcode, go get your own! This entry was posted in Events, Running, Training, Uncategorized and tagged 5k, Cheltenham, fitness, outdoor fitness, Parkrun, running, training. Bookmark the permalink. 8 Responses to Parkrun. It’s running…in a park. That’s great information!! I’ve just had a look and there’s a Parkrun around the corner from me…maybe in a couple of weeks I shall be brave and take the plunge! So it’s ok if I’m not super fast then? I had visions of everyone sprinting off into the distance as I plodded behind, bright red and panting! The Liverpool one at Princes Park is closest to me I’ll have a look!